What do the Louisiana black bear, the Virginia northern flying squirrel, and the Lake Erie water snake have in common? Yes, their official names all start with places, but more significantly they were all removed from the endangered species list since Obama took office in 2009. 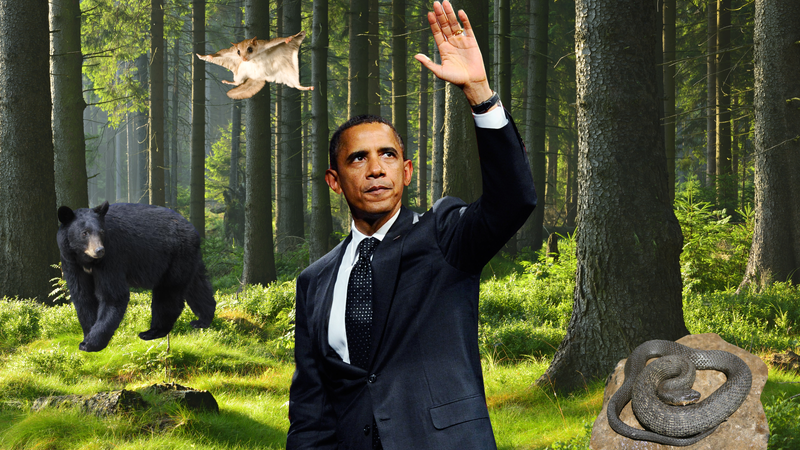 In fact, 15 species of plants and animals have been taken off the list over the course of Obama's two terms, more than under all the other administrations combined since the Endangered Species Act was signed into law in 1973. This is relevant right now because Friday, May 20, is the 10th annual Endangered Species Day. With less than a year remaining in Obama's tenure, Brian Hires, a public affairs officer with the U.S. Fish and Wildlife Service, said he thinks another handful of endangered species could yet be removed from the list before the next president takes office in January. According to Hires, the Hawaiian hawk, Gray wolf, certain populations of Humpback whales, and three other species could exceed the recovery requirements by then. Even as the pace of delistings increases, the list of endangered species continues to rapidly grow—and if many environmental groups had it their way it would grow even faster. Groups like the Center for Biological Diversity and WildEarth Guardians have taken to litigating the government to further their cause and to help protect species from the many dangers they face, which range from development to wildlife trafficking to climate change. Brett Hartl, endangered species policy director for the Center for Biological Diversity, a nonprofit that works to protect wildlife, said they sue when the USFWS allows imperiled species to languish without protections for years or even decades. "If the Service were to complete its mandates on time and proactively protect species at the verge of extinction, we would not have to sue them repeatedly," he said. "They hold their own destiny in their hands." As conservation groups fight to have more species listed, many conservative lawmakers are trying to make it easier to delist endangered or threatened species. This is an especially salient issue in the West and the Midwest where ranchers, farmers, and fossil fuel industry companies feel the law cuts into their bottom lines. In trying to negotiate these competing priorities, the Obama administration has attempted to work out agreements with landowners that focus on volunteer preservation while avoiding the more stringent listings under the ESA. Hires said many of the challenges of delisting a species arise from accounting for all the stakeholders involved, as the species often exist on some combination of private and public lands that can cross state and even international borders. "Successfully preventing the extinction of a species and recovering it so it no longer requires the ESA is a real team effort," said Hires. "It requires intensive coordination and collaborations with state wildlife agencies, private landowners, conservation groups, industry, other federal agencies, and more." In order to be "recovered" and removed from ESA protections, a species must be deemed able to survive in the wild on its own. In making this determination, the USFWS considers the state of the species' habitat, disease or predation, regulatory protections, and other natural or manmade factors. Hires said that the growing threat of climate change is making innovative approaches to endangered species' conservation—such as focusing on entire landscapes rather than individual species—even more important. "Impacts of climate change include increased size and number of wildfires, insect outbreaks, pathogens, disease outbreaks, and tree mortality," said Hires. Higher water temperatures, rising sea levels, and other forms of extreme weather associated with climate change further complicate recovery. While around 2,000 species remain on the endangered species list in the U.S., Hartl said that most of the 60 or so species that have been delisted do fine "because state management is done in good faith and the species are still protected in a science-based fashion." "It only falls apart when states act in bad faith," he said. "Wolves are a good example—as soon as ESA protections were lifted in Montana and Idaho, wolf populations were reduced due to unregulated hunting and trapping." Currently there is a heated debate about the potential delisting of grizzly bears around Yellowstone National Park from the endangered species list. The USFWS proposal, which would transfer management of the bear to surrounding states—all of which would likely initiate grizzly bear hunting seasons—has generated over 5,000 comments. The “bears are facing a range of threats to critical food sources, including white bark pine nuts and lake trout,” he said. In another complex case, groups have been arguing over what to do about the greater sage-grouse for years—a struggling bird whose habitat ranges across a number of central states that also rely on fossil fuel production for their economies. Just this week the oil and gas industry went to federal court to challenge drilling restrictions imposed by the Obama administration to protect the bird. The kicker: The Interior Department worked for years to strike a long-term land-use compromise between conservation and development that would avoid the even more severe restrictions required under the ESA. According to Hartl, voluntary conservation has always been part of the ESA. "However questions about when to protect species must be based solely on science in order to avoid parties trying to game the system, at the expense of species themselves," he said. As for the 15 delistings under Obama, Hartl said "it is a victory and credit goes to the heroic efforts over the last 30 years. It is not the achievement of the Obama administration alone because these successes took years to build up to." Greater sage-grouse on Seedskadee National Wildlife Refuge in Wyoming.